Roosevelt Boulevard is a complex corridor with many needs. The purpose of this project was to take a fresh look at transit needs specifically and develop improvement strategies that could be achieved at grade within the existing cross section of the roadway, at comparatively lower cost and in a shorter timeframe than the subway/elevated line that has historically been the focus of transit planning efforts and remains a long-term ambition. 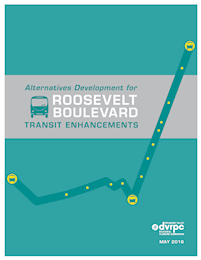 The public has expressed an ongoing interest in improved public transit service on Roosevelt Boulevard, through such feedback efforts as the Delaware Valley Regional Planning Commission's (DVRPC) Dots & Dashes exercise to develop the 2008Long-Range Vision for Transit, the Philadelphia City Planning Commission's 2035 Comprehensive Plan, and DVRPC Choices & Voices feedback for the Connections 2040long-range plan. This project was a response to that feedback, and to a sense that the corridor has been long on plans but short on progress—owing to solutions that have resided in perpetual long range for financial reasons.